Gammon is a classic choice when it comes to feeding the family over the holiday period. It can be eaten warm with vegetables or chilled then sliced thinly and served with the fennel relish and some cheese as a ploughman's lunch. Or simply sandwich between thick slices of granary bread. Preheat the oven to 180°C, gas mark 4. Place the gammon in a large roasting tin with the wine, stock, peppercorns, saffron and fennel. Cover tightly with foil and braise for 65 minutes per kg plus 30 minutes. Remove the foil and cook for a further 30 minutes until the gammon is golden brown. Transfer the gammon to a warm plate, cover with foil and leave to rest for 15-20 minutes before carving. To make the relish, drain the juices from the roasting tin, reserving both the cooked fennel and the juices. Place 100ml of the liquid in a saucepan, add the reserved fennel, garlic, chilli, tomatoes, sugar and vinegar. Bring to the boil and simmer rapidly, without a lid, for 15-20 minutes until the mixture is thickened and pulpy. 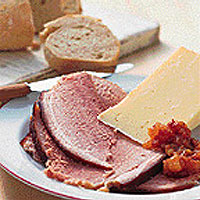 Serve warm or chilled with the sliced gammon. Waitrose Smoked Gammon is smoked over beech wood chips for two days to ensure that it has a deep smoky flavour. Do not be tempted to add any further salt to the stock or the relish.